Advertising is an important part of any business. And the secret to successful advertising is to make a great impression. Fleet vehicle wraps get your business noticed. 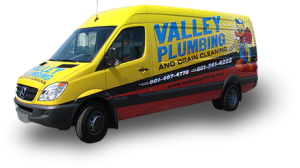 The wraps allow you to use your fleet for marketing and branding purposes. 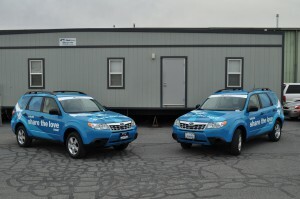 Your fleet becomes a moving billboard advertising your business all over town. Fleet vehicle wraps are a proven and effective business marketing strategy. They offer a combination of marketing and branding, both of which benefit your business. Wraps often cost less than traditional forms of advertising, such as commercials or print ads. And the wraps work with just about any business that has a fleet of cars, trucks, or vans. 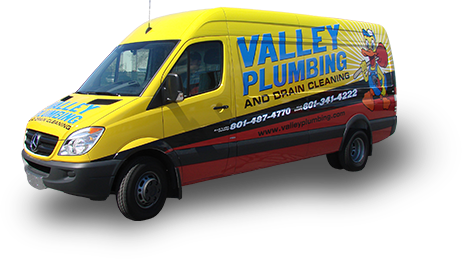 The wrap is a digitally-printed vinyl decal or image that you apply to the vehicle. It adheres to the vehicle, but doesn’t damage the paint in any way. The wrap allows you to temporarily change the appearance of a vehicle. You can change your message or advertisement simply by switching to a different wrap. When you’re done just remove the wrap and return the vehicle to its original condition. It’s nearly impossible to tell the difference between a well-designed wrap and a professional paint job. A good design includes the proper branding and a simple message. The point of a wrap is to attract attention, but you want the right attention. It’s easy to get stuck with a wrap that fails to achieve its goal. That’s mostly because it takes skill in advertising and designing to create effective vehicle wraps. Most importantly, good vehicle wraps should correctly fit the vehicle. Look at the vehicle from all sides. Take curves, handles, and other protrusions into account when making the design. If you’re hiring a designer, make sure to alert them to any changes to the vehicle. Even the slightest change to a vehicle can affect how the wrap design will look. You should decide on several things upfront. Colors, message, and composition are all things to finalize before designing begins. Do some research. Look at fleet wraps used by others in your industry for ideas about what’s possible. The cost of the design will depend on its complexity. The more complicated the design, the more it will cost. You may save some money if you create your own professional design and provide the necessary artwork. Then there’s the cost of producing the wrap. The cost of the materials, labor, printing, cutting, and laminating all affect this cost. The size of the vehicle and how long you plan to use the wrap affect your cost as well. Generally, a full wrap can cost anywhere from $3000 to $5000. If the cost of a full wrap is prohibitive, then you can consider a partial wrap. But as mentioned earlier, the cost heavily depends on the specifics of your particular project. Q. What is a full vehicle wrap? A. A full wrap means the entire vehicle is covered, except for areas that are illegal to cover. It’s illegal to cover the windshield and any mirrors. Q. What is a partial wrap? A. A partial wrap is usually placed on one side of a vehicle. It could also be an image that appears in different areas on the vehicle. It’s less expensive than a full wrap, but as the same marketing potential. Q. Do I have to wrap the entire fleet at once? A. If you’re wrapping a full fleet, it helps to have them done together. This assures that the quality, branding, and design remains consistent across the entire fleet. Doing the fleet separately increases the risk of inconsistent results. Q. What type of vinyl is used for the wrap? A. Different vehicle wrappers use different types of vinyl. 3M, Avery, and Arlon are some top brands. But any reputable wrapper should always use high quality vinyl. A. The time required depends on the complexity of the job. Installation for one vehicle can take anywhere from 12 to 16 hours, maybe less. It would take a considerably longer amount of time for an entire fleet. Q. Will the wrap damage the paint? A. No, the wrap doesn’t damage the surface of the vehicle. A wrap can actually protect the surface and preserve the pain. And if it’s correctly removed, the vinyl doesn’t leave any residue. Vinyl wraps are a viable option for business promotion. Well-established companies such as Coca-Cola often use this method of advertising. 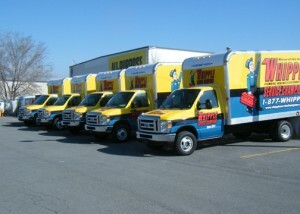 If you’re looking for a cost-effective and reliable way to advertise, then consider fleet wraps. Well-done commercial vehicle wraps get your business noticed.